Our modern facility provides over 12,000 square feet of multi-use space. This includes four distinct areas including the Main Hall, Outside Terrace, Mezzanine, and Roof Top Garden. Whether you are planning a dinner for 10 colleagues, a reception for 300 friends and family, or a concert for 1,000 fans – we have a space that can fit your event needs. 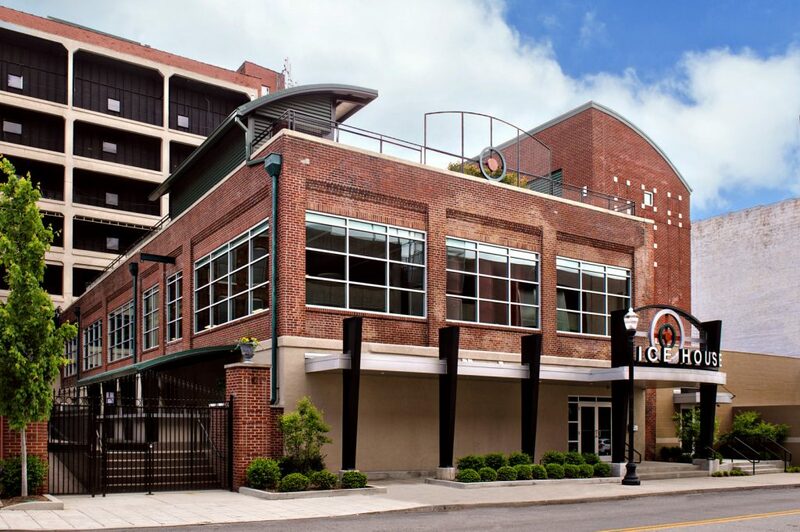 The Ice House is a brief walk to area bars and tourist attractions, Kentucky International Convention Center and Fourth Street Live and just minutes to University of Louisville, Louisville International Airport and the historic Churchill Downs. If you would like exclusive access to all areas within the Ice House, you have the option to rent the entire venue, which encompasses all spaces above. Total Venue Square Footage: 12,800 Sq. Ft.
All spaces can be configured to meet your event specifications and can be arranged in a variety of ways. Our built-in natural stage within the Main Hall is perfect for musicians, speakers and other forms of entertainment. The Mezzanine on the second level surrounds the Main Hall, allowing your guests to survey the event below. Spacious loading docks and direct room access allow easy setup and breakdown for your vendors. Our team is available at every step to answer questions, offer assistance and quickly fulfill your requests with unlimited pre-event coordination. On-site catering and audio/visual departments make planning your event at the Ice House convenient and easy with one responsive team for all your needs. From linen and china rental, to floral design and arrangements, to in-house catering from our exceptional catering company, Crushed Ice Catering, you can expect the same exemplary service and unmatched professionalism. Whether the Ice House is needed for a ceremony, reception, conference or private celebration, we are dedicated to perfection and excellence in service.